THE FOLLOWING WAS WRITTEN BY MILES JOHNSTON, THE FOUNDER OF KISS FM, MONAGHAN TOWN, IRELAND. KISS FM 103.7 / AM 1008 / 1413 / 927 - KISS was to be the Last Superstation. For over ten years Dublin and the rest of Ireland had their Superstations, and a myriad of smaller stations of every variety. But Belfast just had the same old dull boring Downtown Radio, and it was not even 24 hours. Miles Johnston, a BBC Engineer, had been supplying transmitters, and writing about the Irish Era of pirate stations for many years. The connection with an E.T. wave in the early 1970s sparked the start of the Irish Pirates, with Radio Dublin, and that is another story. 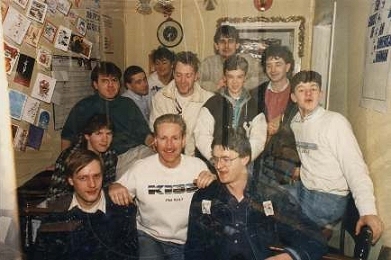 "KISS 103 Craigavon was Ulster's first commercial pirate, running only 100 watts from Portadown in 1984. It was raided in March 85. The name KISS-FM was being used to mark the jamming of the big Dublin Superpirates in the early 80s, using RTE staff and equipment, with a nod and a lot more from the BBC. There was another agenda running, involving the utmost secrecy, and I got a "go" from a member of the BBC Board of Directors, who had been in Dublin studying what was going on. THAT is another story! KISS FM 102.7 was the casualty of the jamming. "KISS Craigavon was a flag waving exercise, and they came and raided. This created ZEE-103, which came out of Omeath, using a 2.5 KW Italian transmitter into eight 6-element yagii. The late Frank McCarthy eventually built the station, after a year or more of politics, where I had to take a back seat. This let me fully concentrate on raising finance for a massive border-blaster, so that we could get the kind of fantastic radio that Dublin had enjoyed for over 6 years. "My colleague Jeff Camblin, friend Steff Callister and I got the finance. This involved prominent business interests from Armagh, Gribben, Stevenson and Flynn. Another prominent Ulster businessman, Jim Stafford took high level steps to get the station crushed from day one, this resulted in me being FIRED from the BBC, in October 87. The "E.T.s" had acted, and I was full time on the project. "We needed two sites, an AM, and FM site. Studios were to be located in a plush building in the centre of Monaghan Town, but this fell through, and we used a unit in Old Cross Square. During the winter of '87, with impending legislation always just around the corner, studios, and both transmitter sites were made ready. A CCA 5KW AM was commissioned for 1008 kHz, and was on air in January 88. This ran test tapes for a long time, as the studios took forever to get ready. Severe sporadic interference from sparking ESB power lines delayed us getting a link from site to studio. The FM site had been running a frequency-keeping transmitter since October. Shortly before launch, the 160 ft. lattice mast came down in severe gales, and delayed the FM launch for 2 months. Zee 103 veterans Owen Barry & Jeff Camblin, and then Big D and NOVA veterans Roland Burke, Pat Cunnane and Denis Murray came from Dublin to finish the team. We carried Scott Shannon and Gary Owens syndicated programming at the weekend. There was one occasion when Downtown got our Scott Shannon, and we got their Rick Dees! 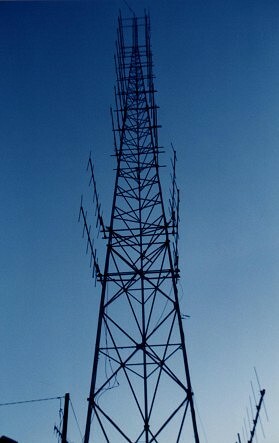 The station aired in April '88, with a 500 KW signal on FM into Belfast, and 5 KW on 1008 kHz AM. The AM channel was selected because Hilversum 3 shut down quite early in the evening, which gave us a huge night time spread, and we sounded like a 50 KW, once we got "clear channel". "We had three. Main Self-Op: - Had 2 BE triple stack carts, London Lab turntables, 2 Denon CDs (only domestics), and Sountec desk. DJ ran into a catscradled RE20. Beside this, through the window, was the announcers' studio, which also fed the commercial production studio. This had a 24 channel Soundcraft desk, which fed ½" OTARI 8-track Reel machine. Two PR99s were used upstream, along with another London Lab. Processing was with a cranked up Inovonics 3 bander (new at the time). This was aggressively set up by Hardy, and ex-Voice of Peace part-timer Brian Robinson. Brian had also served time on Sunshine and NOVA, but was then in the civil service. if only to talk to people from the station, but alas the KISS-Jocks did not want them! The station format was an aggressive Top 40 Clutter-Free style, with JAM Jingles KISS-FM, and the great Charlie Van Dyke, whom I personally approached to give us the best IDs any station could wish for. "AM 1008 <ten O eight> - FM 103.7 - We Are KISS FM - Monaghan Town". The Station output, went via a jackfield into two SBS UHF links, so that AM and FM could be run separately. The board vetoed an approach from Hugh Hardy (no relation) to run KISS Country, but KISS could have run two stations if required. The AM site had a brand new Optimod 9100B, which fed the two CCA and Bauer transmitters at Boylan's abandoned Pipe Factory, near Monaghan town. Peter Gibney, from Sunshine Radio was brought in, as he had the AM Bridges and set up gear, to configure the 200 ft. mast, and ATU. The addition of a second frequency, and the change of frequency meant we had him back a couple of times. Meanwhile having designed it all, I kept it going, for the full 18 months. 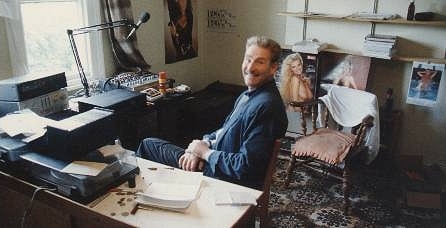 Next we had the Office, where Tom and Miss Monaghan, Kay Lamb, worked, on the new Amstrad PCs... in 1988! News was next, and was in true pirate style, Four radios, and cassette machines, and Teletext TV. 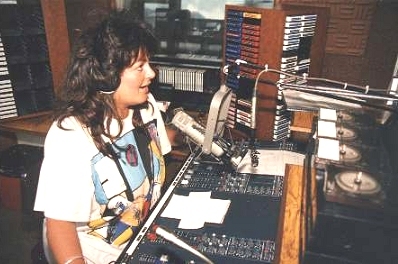 Susan Charles was head of News, and local, ex-Downtown producer, Con McConville did mornings. Con was to be invaluable, with his music industry contacts, along with the rest of the team. "Meantime archrival, Frank McCarthy got his station on air, K.I.T.S. 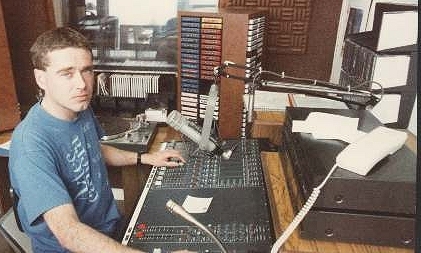 FM 100. This also broadcast from Monaghan town. K.I.T.S. was a friendly station with a typical "pirate" feel, and spawned a large loyal listenership in Mid Ulster. Its signal also drifted into Belfast using 800 watts into an 8 x 4-Element yagii. K.I.T.S. also went AM later on in the year. But KISS needed every one of its 1.2 million watts, to get up that aerial for a chip shop signal, which reached Scotland. It did however have three side lobes that got to parts of Derry, Dublin, and the west. Caroline, ARD, Big D and NOVA veteran Tony Allen had asked to join the station, but regretably, Tom thought the better of it. Summer came, and Ray Burke (Minister of Communications) announced his Bill to kill off the pirates. The date was set, we all had until the year's end. We channel-hopped, and also brought in a good old 1958 Bauer 1kW. 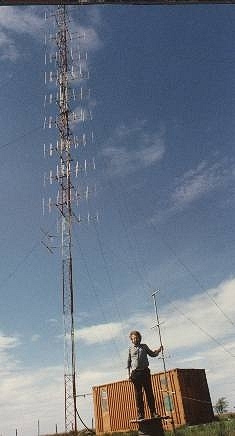 During the summer, we had the FM mast cut down. Years later, a certain person was to admit to Jeff Camblin, that he had the job done. Well, we just came back with even more power: - One Point Two Million Watts! That's where we stayed, until closedown. Jeff and Miles had a UFO event, one week before close. This plus the "intell" men, and strange going's on, were all to reveal more after KISS-FM. 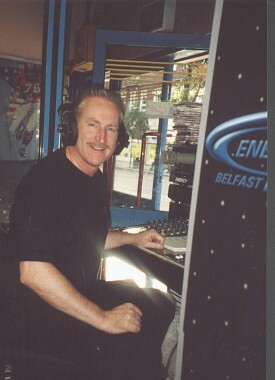 Miles at KISS FM 103.7 Mast, Lough More, Co Monaghan, 300 yards from Northern Ireland. Full power output of the stack was 1,180,000 Watts. (1.2 Megawatts, or a million watts in old money). This sent a directional beam into Belfast, and had 3 large side and rear lobes of around 15KW. This provided substantial coverage in the Irish Republic, due SE to Dublin, and into the North West, into and over parts of Derry. Engineer, and creator of the station Miles is in the picture. 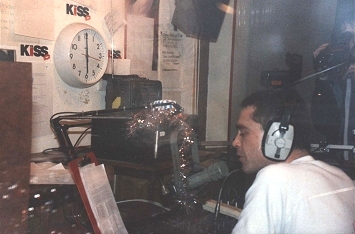 "KISS FM 103.7, (1.2 MW), and 1413 (5 KW) closed down at 18.00 Hrs Dec. 30th 1988. The rest of the stations bowed out during the day, and night. Some, like K.I.T.S., closed during the 31st. However, Eamon Cooke, of Radio Dublin took Burke to court. The Supreme Court gave him a case to answer... Burke's Law was unconstitutional! Two stations stayed on: Radio Dublin, and Radio Star Country, both still broadcasting today, over TWELVE years later. And what of Burke and his boss Haughey? Just keep reading the Irish Times. 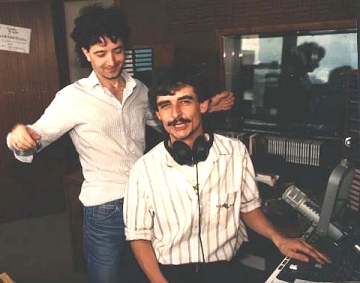 In September 1996, Lawrence John asked me to restart KISS FM. I did. It's now called ENERGY 106.6, and has been on air for over 3 years. Nothing like its former sister... buts it's early days. And yes, the E.T's abducted Lawrence, just beside the KISS FM transmitter site, and yes, the "intell" men are still about." The above contribution was written and pictures supplied by Miles Johnston, the creator and engineer of both stations, and our thanks go out to him for permission to use them on this website. The Irish Tourist Board Admire the Energy Tower! © Miles Johnston 2000. Kindly donated.